We traded in rosé for spiked cider and watermelon sorbet for pumpkin pie (just the smell of cinnamon has us salivating) a while ago, but we're only now realizing that the holiday season's mouth-watering indulgences can come at a higher calorie count, jeopardizing our formerly healthy diets. Add culinary temptation in with travel plans that throw us off our fitness regimens and we're really in for trouble—or are we? Fitness expert Francesca Valarezo argues that staying healthy during the holidays is not only possible but also doesn't have to entail being too restrictive. Yes, this means we can still have dessert and not throw all of our hard work out the window. Valarezo's fitness- and health-related wisdom is endless, but we asked her to narrow things down to her top five tips. Ahead, we're sharing the details of her nonrestrictive plan (and why we're using the Tory Burch Hybrid Smartwatch to help us follow it). While it may be cold and damp outside, winter is one of the most drying seasons for our bodies (just check your hands for proof). Our skin certainly requires a lot of extra moisture this time of year—which we can achieve by upping our collection of face mists, hand lotions, and sheet masks—but our bodies need the same type of TLC too. Valarezo advises us to choose tea and water whenever possible, especially while traveling. Luckily we can set the "drink water" goal on the ToryTrack app and track our daily intake using the customizable buttons on our hybrid smartwatch, which syncs directly to our phones. As far as alcohol goes, Valarezo doesn't expect people to completely abstain. Instead she suggests opting for a glass of wine over a mixed drink, as wine is less likely to pack in hidden sugar. Valarezo doesn't necessarily think it's realistic to completely steer clearly of holiday treats (phew), but she does recommend making them at home to avoid processed ingredients, which tend to have added sugar. For those days when we want something sweet but don't want to splurge too much, Valarezo has just the fall recipe to cure our cravings: baked apples topped with cinnamon and coconut-milk ice cream. Count us in. Whether we're jet-setting to another country for an extravagant vacation or heading to our hometown for a family visit, holiday travels are an added obstacle to our exercise regimen. Valarezo's solution? "Sweat at least 10 minutes a day," she tells us. While clocking in a full workout away from home is ideal, it's important to remember that something is always better than nothing. She suggests squeezing in push-ups or a few quick yoga poses if a 60-minute session just isn't in the cards on any given day. We're fans of using the Tory Burch hybrid smartwatch to keep track of our steps and burned calories. We also love that this smartwatch is chic enough to wear to any festive evening obligation, meaning all of that dancing we're bound to do at upcoming holiday parties will count toward our goal too. Valarezo also suggests taking advantage of being away from our neighborhood fitness studio by trying something new. During the colder months, she loves practicing hot yoga to cope with the weather and get a challenging workout in. Bonus: "It helps us create digestive heat, and keeps our joints lubricated and warm," she notes. No matter what our health goals may be for the holiday season and beyond, Valarezo reminds us that writing them down makes us feel more accountable (read: less likely to slip up). 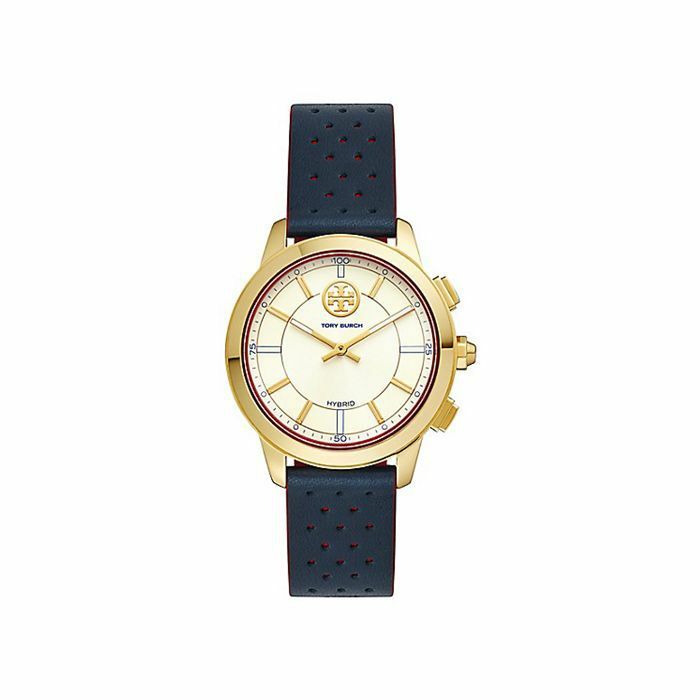 The Tory Burch hybrid smartwatch's customizable buttons can be set to check our activity goal progress—the hands move to show the percentage of our goal achieved—and to keep up with our own personal fitness objectives that we specify using the ToryTrack app. We'll be making sure to jot down some of our personal goals as well before the New Year kicks in. Want to start the season on a healthy foot? 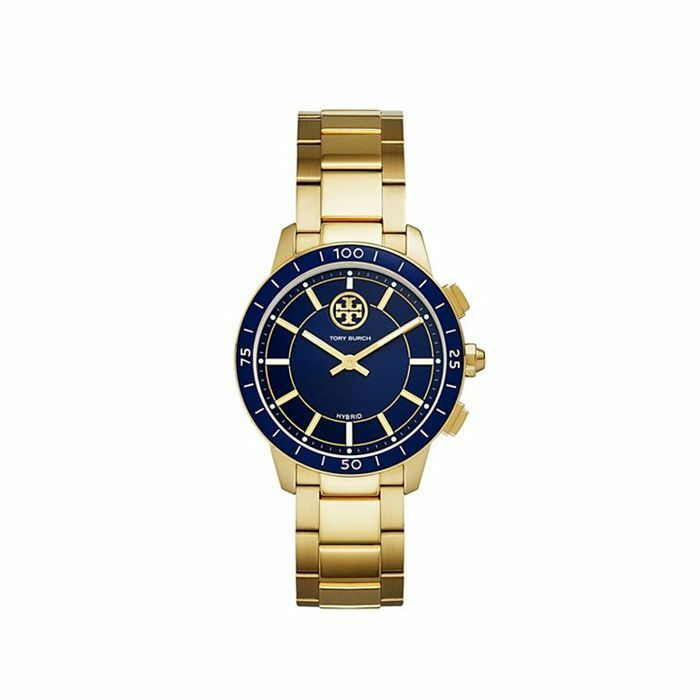 Shop more Tory Burch smartwatches to help you achieve your goals.